"We the People of the United States, in Order to form a more perfect Union, establish Justice, insure domestic Tranquility, provide for the common defense, promote the general Welfare, and secure the Blessings of Liberty to ourselves and our Posterity." 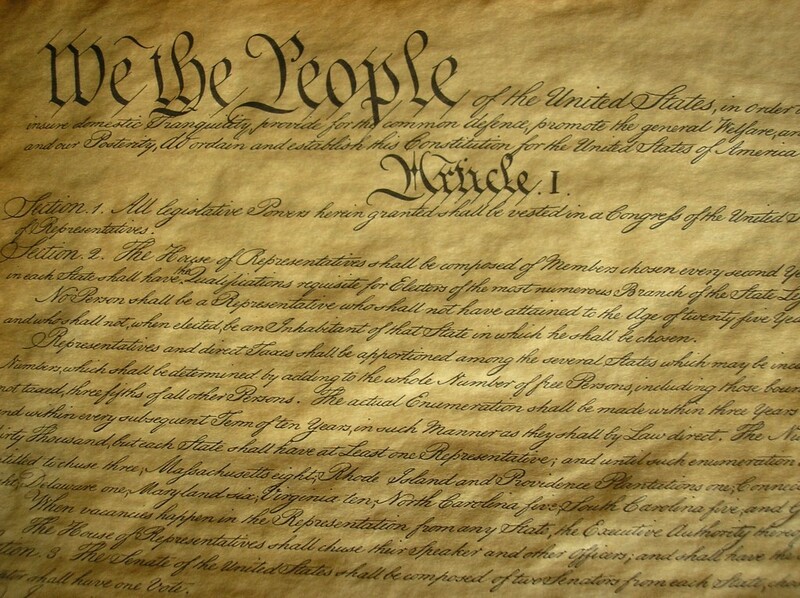 Constitution Day commemorates the signing of the U.S. Constitution on September 17, 1787. Each year the University of North Florida celebrates the week with special programs and activities. All events are free. Constitutional resources will be on display at the Thomas G. Carpenter Library all week. Pocket Constitutions will be handed out to first visitors at events. Enter the Constitution Day essay contest! The winner will receive a $100 scholarship. Contest details. Trivia night at the Boathouse with a Constitution theme. Come have fun and test your Constitution knowledge. The event will take place from 6:00 p.m. - 7:30 p.m.
Samir Gupte, a local American Civil Liberties Union representative, will unpack the myriad of initiatives on the November ballot that have the potential to impact civil liberties. The event will take place in building 9, room 1421 from 6:00 p.m. - 7:30 p.m.
Register to vote at the Market Days voter registration drive sponsored by Student Government. The event will take place in the John A. Delaney Student Union Osprey Plaza from 10:00 a.m. - 2:00 p.m.
"Answering the Call: The American Struggle for the Right to Vote"
Osprey Productions and the Thomas G. Carpenter Library present a voting rights documentary film by Brian Jenkins. Refreshments will be provided, courtesy of the library. A discussion moderated by Dr. Albert Dorsey will follow the 7:00 p.m. showing. The event will take place in the John A. Delaney Student Union Auditorium (building 58W, room 2704) at 7:00 p.m. and 9:30 p.m.
Samir Gupte will hold a round table discussion featuring questions such as, how do you develop and articulate your position? How do you find out who can influence your desired change and then influence them to make it happen? The event will take place in the Writing Center (building 4, room 2501) from 11:30 a.m. - 1:00 p.m. The Southern Poverty Law Center will review the history, impact, and discuss Florida Amendment 4, restoring voting rights to felons. The event will take place in the Student Government Courtroom (building 58E, room 3300) from 6:00 p.m. - 7:00 p.m.
End Constitution Week by enjoying coffee and cookies as you grab your free pocket-sized copy of the Constitution. Sponsored by the Department of Diversity Initiatives. The event will take place outside building 2, near Peace Plaza from 10:00 a.m. - 11:00 a.m. Constitutional resources were on display at the library all week. Pocket Constitutions were handed out to first visitors at events. U.S. Federal Judge Timothy Corrigan and Dr. Matthew Corrgian talked about the Constitution and the First Amendment. The event was held at the Thomas G. Carpenter Library, 1st floor from 7 p.m. - 8 p.m. This event included a roundtable with student activities. Featuring Brandi Denison, Rosa DeJorio, Bill Delaney, and Keith Cartwright with Linda Howell as moderator. The event took place in the Writing Center, building 4, room 2501, from 11 a.m. - 12 p.m.
Phi Alpha Delta Pre-Law Society members shared best practices when it comes to contacting your local, state, and federal representatives. This event took place in the Student Union Osprey Plaza from 10 a.m. - 2 p.m. Discussions with Julie Ingersoll, Professor of Philosophy and Religious Studies. The event took place at the Thomas G. Carpenter Library, Special Collections Reading Room from 3:30 p.m. - 4:30 p.m.
Dr. Amanda Reid, Associate Professor of Law at Florida Coastal School of Law and Dr. Adrienne Lerner, UNF Director of the pre-law program discussed the First Amendment and how it relates to trademarks. This event took place from 5 p.m. - 6 p.m. Constitutional resources were on display at the library all week. Free Pocket Constitutions were handed out at Market Day in the Student Union Osprey Plaza from 10 a.m. - 2 p.m.
Courageous Conversations is a collaborative speaker series that examines current events and policies in our nation that directly impact our community. This specific event examined racism and reality. Facilitators guided students, educators, employees, community leaders and citizens through civil discussion to address current issues on race and the media. Included in this was a discussion of the evolution of technology as it affects racial matters. Small group discussions followed focusing on ways the media can improve its portrayal of people of color in our community and across the nation. A reception followed, sponsored by the Taylor Leadership Institute. Discussion facilitated by Dr. Roy Kaplan, former executive director of the National Conference of Christians and Jews and Dr. Navita Cummings James, Associate Professor of Communications, USF. The event was held in the Student Union Auditorium 58E, 2704 from 2 p.m. - 4:30 p.m. Explore the American Identity: "What Should it Mean... to be an American?" The Office of Undergraduate Studies screened the documentary film by Ken Hurley. This film interviews Americans from all 50 states to ask them what being American means to them. The documentary explores our American challenges, problems, hopes, dreams, and aspirations. Discussion was moderated by Dr. Parvez Ahmed. The event was held in the Student Government Senate Chambers, 58E at 6 p.m.